Complete lowering of the table (the flask with the mould is set onto the rollers of the mould conveyor and the pattern plate carrier is centred in the internal pattern change device) and transport of the moulded flask out and simulations the empty flask in the moulding station. The concept of the FORMIMPRESS® moulding system originated from the constant and careful observation of the difficulties usually met in attempting to obtain sufficiently accurate moulding to achieve the highly precise castings able to meet increasing market requirements. 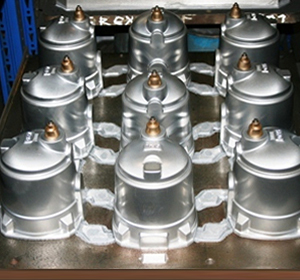 By talking about foundry jobs in the foundries, comparing the opinions and analysing advantages and disadvantages of the various processes employed in moulding, it emerged that the ideal moulds should have a high impression hardness, able to guarantee the production of dimensionally correct castings, also maintaining a good gas permeability (as for the jolting and compression moulding). This was not easily achieved by any means. In fact, everybody knows that the dimensional reproducibility of the casting is strictly related to the mould hardness and that the mould hardness is attained with high pressure, to the detriment of the permeability and so on. The plant manufacturers, inspired by the new market activities, began to look for solutions to problem, some in one way, some in another way. 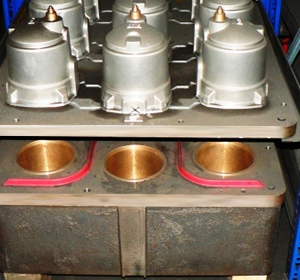 Now, castings production, by adopting these new technologies, has had a considerable improvement in quality. Once the quality purpose had been achieved, the installation and operating costs of the new systems also began to be considered. The direction indicated by the operators was the one with simple systems; easy to use and with contained management costs, yet maintaining the same quality standard. Among the noteworthy remarks emerging from the observations made, it turned out that, if it were physically possible to carry out the moulding with high pressure and obtain, on the two faces of the flask, inverted hardness values compared to the normal situation, (that is to say, the hardness of the flask back side on the impression side and vice versa), the problem would be solved quite easily. In fact, this way, one could obtain impressions with a constant hardness on the whole surface of the flask, maintaining at the same time a good gas permeability due to the natural shade originating near the walls of the flask itself. At this point, the idea of putting into practice the intuition of the old foundry men, who wanted to place the pattern on the contrasting plate of the machine, takes shape. 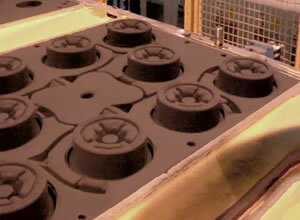 Particularly by working on this intuition, we have come to the realisation of the FORMIMPRESS® moulding system. The idea of the “old foundry men” of using the pattern in order to compress the sand, has come to fruition! The moulding System proposed by the Savelli Company under the registered trademark FORMIMPRESS ® is extremely simple: It does not require any special and expensive equipment and, consequently, any technicians with special training. 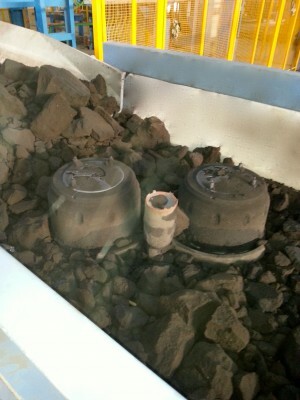 The moulding system comprises a simple impression of the pattern into the moulding sand contained in the flask. The forces originating during the squeezing phase are opposed by a counter force. 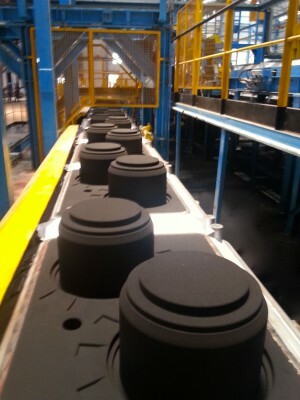 The principle of moulding by impression differs from the normal high-pressure squeeze system only because of the different movements of the pattern and of the moulding sand in comparison with the flask to be moulded. With traditional moulding systems the flask is on the pattern plate and the frame placed on the flask collects the soft sand required, which will consequently be compressed. The pattern plate, the flask and the filling frame create a single group, in which the moulding sand is pressed by the squeeze head (contrasting force) against the pattern plate, until the desired hardness is reached. 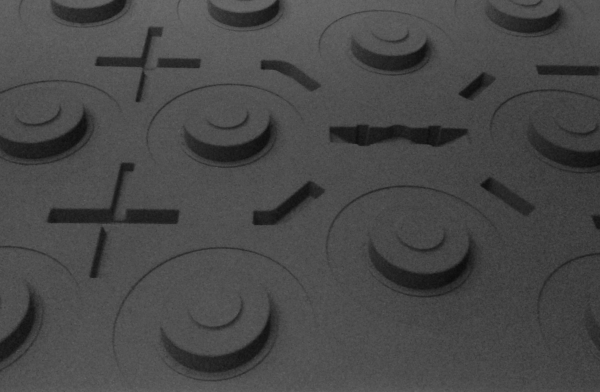 With the FORMIMPRESS ® system, on the contrary, the filling frame is placed between the flask and the pattern plate. In this case the flask and the filling frame create a single group while the pattern plate, free to move, pushes the moulding sand contained in the flask and in the filling frame against the squeeze-head placed on the upper side of the machine. 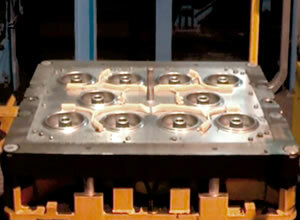 The counter force produced by the squeeze-head makes it possible to pre-set the mould hardness. With the FORMIMPRESS ® moulding system we have, (in comparison with the traditional methods), an inversion of the flow conditions of the sand grains, as the sand layer in contact with the pattern receives the necessary energy for the compaction directly from the source. The sand grains which compose the contact sand layer are the first to be affected by the pattern movement, when they still have a good degree of mobility, which enables them to easily fill the microcavities. The sliding resistance offered by the flask walls and the damping realized by the upper sand layers, brings about a negative gradient of the degree of compaction. The working cycle of our moulding machine foresees that the quantity of moulding sand (in accordance with the pattern plate) has to be weighed inside a weighing hopper, to make sure that the flasks are always correctly filled. (The quantity of moulding sand is automatically corrected according to the compaction degree measured during the previous moulding cycle). The weighing hopper is placed at a considerable height, which is calculated according to the type of flask employed. Such a height favours the pre-compaction of the moulding sand during the fall phase, thereby avoiding the formation of damaging “air pockets”. The energy employed for this operation is cost-free and it does not produce any abrasive effect on the surface of the pattern plate. The FORMIMPRESS® System does not require any valves, nozzles, venting etc. Consequently, it does not imply any maintenance or spare parts cost.